I’ve been watching Carolyn Resnick’s Waterhole Rituals DVD. I don’t agree with a lot of her horse psychology and dominance theory approach. However, she does make some good points. In the beginning of the DVD she talks briefly about the power of curiosity as a motivator. Instead of chasing our horses around and around a roundpen, we should do things to develop the horse’s curiosity and get the horse interested in being with us. I was reminded of one of my all-time favorite series of photos. 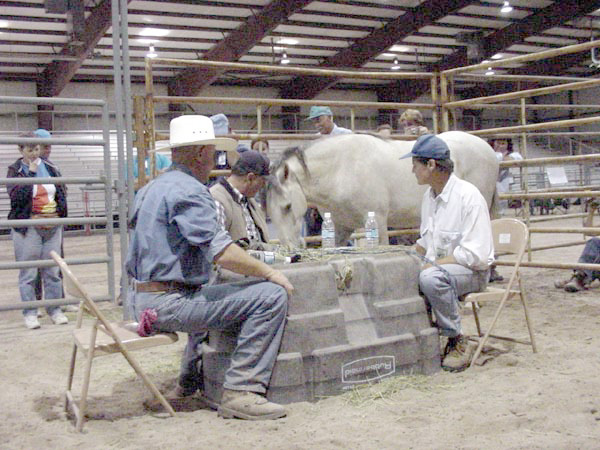 (click below to see horse trainers playing poker with mustangs). This is from a series of photos that can be found on this website. Many mustang trainers “win” the animal’s trust through roundpen work, join-up, approach and retreat, or similar processes. Basically, they chase the animal around until the animal gives in, submits and decides that listening to and following the person is preferable to being chased around. Instead, these guys halter break mustangs by completely ignoring them. Most mustangs haven’t had a whole lot of human contact and are naturally gregarious and curious about people. So, they sit in an arena playing poker, while totally ignoring the mustang. Eventually, the mustang decides to investigate what’s going on. As soon as the horse approaches, they click the clicker and give the horse a treat. Pretty soon, the horse figures out that poker is a pretty fun game. All the horse has to do is stand there, and this crazy guy clicks a clicker and gives him a treat. Gradually, using successive approximations, they shape the mustang to lower it’s head, allow touching, and allow a halter to be put on. So, the mustang’s first haltering experience happens with the person sitting in a chair–without any force, excessive pressure or punishment. And the horse starts thinking these humans might be pretty cool animals to hang out with.